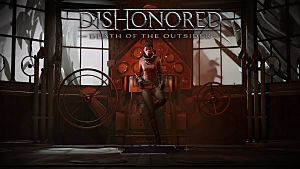 The Dishonored finale, Death Of The Outsider, of course, includes a new batch of achievements and trophies as you play the game either using the lethal or non-lethal methods, choosing to remain stealthy, or go sword slashing and guns blazing. There are a whole bunch available in Mission 2 if you're willing to take the time away from the primary mayhem-making objective, but the entire game features various trophies and achievements to earn. Below, we cover how to unlock every single trophy and achievement in the game. While hunting down those last few, don't forget to catch our black market vault robbing guide here as well! There are a total of 30 achievements/trophies to unlock, ranging from your typical storyline completion goals to completing side quest Contracts and even some more difficult tasks that take a little planning. Let's dive in. Listen to what swarms of rats have to say five times. This one is available almost immediately. Leave Billie's ship by using the pipes on the side and you will come across a group of rats. Just use her power to eavesdrop on their conversation five times in a row. This one pops just before going through the first mission and completing your objective of freeing Doud from the electrified cage while searching the black magic fight club. Finish a mission without killing anyone. This is simplest to do on the first mission as there aren't very many guards. Just sneak past everyone or use entirely non-lethal take downs to get the trophy at the end of the mission. Take both bank vault keys. The second story mission completion achievement, this one unlocks when you grab the second vault key on Death Of The Outsider Mission 2. Steal the audiograph from the gallery without disabling the safeguard floor. In Mission 2, the second floor of Shan Yun's building features an electric floor trap. You can disable it -- but don't. Instead, position yourself near the door by the stairs and shoot out the glass of the display case across the room, and then drop a Displace marker inside the case so you can grab the audiograph without actually touching the electrified floor. Use Semblance to mimic Shan Yun and sing into the microphone. Also during the second mission at Shan Yun's house, use your newfound Semblance power to pretend to be Shan Yun himself, then walk up to the microphone and belt out a few lines for an easy achievement. Drop Ivan Jacobi through the trap door. During Mission 2, you will see Ivan in the courtyard area on the stage. Mark him with Foresight so you know where he is standing, then either sneak or Displace your way down the stairs into the basement and take out the guard without being seen. Go into the room on the right side and look for a lever. When Ivan is positioned over the trap door, pull the lever for the achievement to pop. Use Displace on a marker placed with Foresight and eliminate a target. In Mission 2 -- Follow The Ink, use your Foresight power to mark any random civilian you see sitting somewhere, then use Displace to pop on top/next to them and immediately assassinate. Make an enemy explode into pieces using Displace. You can get this one right before or after the previous trophy. Just set your Displace marker inside a target that's standing still and then Displace inside of them. It's messy -- but worth it. Send someone flying 40 meters using Hook Mines. Buy a hook mine from the black market shop keeper in Mission 2 and head for the canal where you can see a civilian sitting and fishing. Standing on the railing, and with the hook mine on the lethal setting, place it on the stone section of the bridge near the canal. It should send the fisherman 40 meters and unlock the achievement. Shoot a guard in the head with a fountain pen. Also in mission 2, buy the makeshift bolt upgrade at the black market, then look for a pen sitting on any desk, which will now be marked as Voltaic ammo. Now use the makeshift pen ammo and hit a guard in the head for the trophy! Have a guard salute you. In either Mission 2 or 3, use Semblance to take the face of one of the higher ranking guards in red, then stand in front of a lower ranking normal guard so they give you a salute. Make three people vomit using a single bottle of Plagued Spirit. In Mission 2, get a tattoo at the Red Camellia Beauty Parlor and then travel to the second floor of the Spector Club. Grab the bottle of Plagued Spirit near the trio of people hooked up to the machines. The simplest way to unlock the achievement is to throw in the middle of the room so it makes all three victims start vomiting immediately. This is the third storyline achievement, which pops when you grab the twin-bladed knife weapon in the vault during Mission 3. Note that just before this, you can also get the Obsessive Safe Cracker achievement (see below). Open every safe inside the main vault. Just before grabbing the twin-bladed knife from the main story vault in Mission 3, you have to unlock the other five vaults in the area for this achievement. The five other safe codes are 011, 235, 813, 455, and 891. Win the auction at Colibron Plaza. You will need 400 coins on hand for this achievement. During Mission 3 -- The Bank Job, there eventually will be an optional objective labeled "Sedate the Bank Personnel (Look for the Pharmacy)." 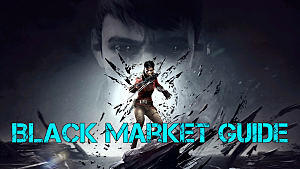 With this objective added, read the note in the pharmacy, then talk to Teresia Cienfuegos above the black market shop. Now, go to the auction in the nearby building and use Semblance to take the guide of anyone there bidding and sit down in a chair. As long as you win the auction with your 400 coins, the achievement will unlock. Make sure to grab the poppy tincture after winning the auction as you need it for the next trophy. Empty the vault without tampering with any security systems, leaving everyone unharmed and asleep. To get this achievement, you need the poppy tincture from the auction and a hag pearl. Head to the rooftop entrance of the bank and use the tincture in the air ducts, then go down the set of stairs and into the white wood door to the right of the big metal doors. Jump from the railing to the chandelier and then into the open window. Jump down the side to your left and use the terminal to open all the doors in the bank. Return the exact way you came, and then go through the metal doors that were previously closed. This is the tough part with the arc pylons, because you can't deactivate them. Stealth your way through the side rooms on the left, using the hanging ceiling lamps when necessary so the pylons don't detect you. After the pylons, Displace up to the next floor to stay out of sight of the clockwork soldier. Near the door, look across to the barred windows and use Foresight and Displace to cross over (be on the lookout for another patrolling soldier here). Unlock the door and proceed up the balcony. Near the open metal door, head up the railing to the window. This is the next tough part that usually takes a few tries -- you have to launch the hagpearl and hit the button on a terminal. When you hit it, go upstairs and rob the vault, then exit the bank for the achievement. Send the vault crashing through the floor. Also during the bank heist in Mission 3, head to the third-floor elevator and Displace into the small open hatch at the top so you can climb into the maintenance room. Use Displace to access the vents and byspass the room's security. This part is trial and error, as it's easy to get hit by the arcs and die until you find the sweet spots. You will have to run and Displace along the walls until you reach a table where you can grab a note and a broken lever. Head to the hatch and use the chain to reach the locked vault, then use the lever to detach the brakes, sending it crashing through the floor. 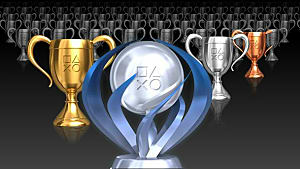 This is the Mission 4 storyline trophy, which unlocks after you obtain the silvergraph during the course of the mission. Attend the meeting as Brother Cardoza. During Mission 4, go to the top floor of the conservatory and wait for the sister to leave the curator's office area. Use the Semblance power to take the form of Cardoza and then go talk to the group on the balcony. Break four Oraculum censors and listen to the prophecies. On the second floor of the conservatory in Mission 4, look for a room where several sisters are lying dead. Just use your blade to knock over the four censors positioned around the room. Touch the Eye of the Dead God. Your Mission 5 story achievement unlocks when you arrive at the Eye Of The Dead God. In Mission 5, the cultists are extremely hard to kill normally, so to get this achievement, mark one with Foresight and then set a Displace marker on his waypoint. When he arrives in that spot, Displace into him to stun the cultist, then perform an assassination. Push an enemy to his demise using Void Strike. Also in Mission 5, look for a cultist standing near a ledge who can be pushed off for a quick an easy trophy. During each main mission, various optional Contracts become available that are marked on your map. Complete all 13 throughout the first four missions to get this achievement. Collect all Eleuterio Cienfuegos paintings. During the first three mission, eight different paintings are scattered around the buildings. There's one painting in the first mission, three paintings in the second mission, and finally four paintings in the third mission that must be grabbed to get the achievement. Since it's literally the title of the game, you'd think it would be a required achievement, but it's actually one of two options. This is the achievement you get if you choose the lethal take down option at the very end of the game. Return the Outsider to the mortal world. The second end-game trophy option, this one unlocks if you decide to perform the non-lethal takedownn option. You just have to do all the non-killing options throughout the level and then initiate dialog with Daud instead of killing the Outsider. Finish the game without being detected. For the stealth completionist, this the achievement for playing the entire game while never once being noticed by a guard or mark. Make sure to save often and keep your non-lethal options handy. At the end of each mission, the summary will inform you if you were noticed. 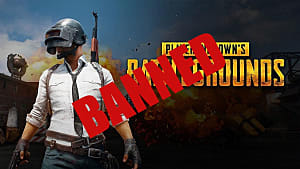 Finish the game in Original Game + mode. Just play the game a second time after the first playthrough and make sure Original Game + mode is turned on (which lets you use powers from the previous games). And there you have it -- all 30 Death Of The Outsider achievements and trophies! Did you find any other ways to get these to pop easier? Let us know in the comments section below! 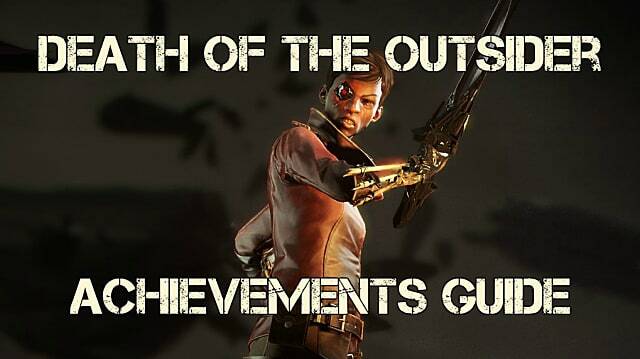 If you need help with any other part of the game, check out our all Death Of The Outsider guides here!